dairy cows produce more milk when listening to relaxing music. They believe farmers could get an extra pint from their charges by playing classical music or slow numbers in the cowshed. Beethoven’s Pastoral Symphony and Simon & Garfunkel’s Bridge Over Troubled Water were a big hit in the milking shed. But when rowdy numbers, like Mud’s Tigerfeet and Size of a Cow by Wonderstuff, were played, there was no increase in milk yield. Some farmers already play music to chickens, as there is anecdotal evidence that it reduces stress. Dr North took the lead when he saw many farmers believe that music can boost milk production. I think that in 100 years, people will look back in wonder that we could not recognize animal’s feelings and view it as we now view historical figures who thought that Native Americans had no souls, or that slavery was God’s plan. This blindness is the same factor that prevents us from recognizing the humanity of those with whom we go to war. In order to continue to believe in a moral world (that conveniently works to our advantage), we have to devalue those whom we exploit or kill for resources. The study was carried out at LCAH Dairies in Lincolnshire and Bishop Burton Agricultural College in Humberside. One-thousand-strong herds of Friesian cows were exposed to fast, slow and no music for 12 hours a day, from 5am to 5pm, over the course of nine weeks. The researchers found that each cow’s milk yield rose by 3% (0.73 litres) a day when slow music, rather than fast music, was played. The work adds to evidence that calming music reduces stress in animals, as well as people. Most theories of music preferences are based on humans. It was found that slow music improved milk yields perhaps because it relaxes the cows in much the same way as it relaxes humans. The researchers are now seeking further funding to see whether music can help other animals. I love all animals but cows are the best. They are so neat and gentle and their huge eyes. I gave up eating meat after my parents sent my cow to the works this year. I worked on a dairy farm so cruel but I didn’t let any calves go on the bobby truck. I got homes for them all. Cows are sedentary creatures. They like to eat grass, stand still and occasionally moo. And they don’t like to rock. However, they do seem to enjoy calming pop ballads. However, faster songs seemed to trouble the animals, slightly reducing their milk yield. 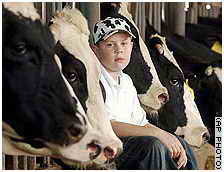 Daniel McElmurray from Hephzibah, Georgia, recently won first place in a regional science fair for a project on how music improved milk production in cows. After hearing his dad, Earl complained about weak milk production from their 300 cows, the 10-year-old student at Goshen Elementary in Augusta helped solve the problem with a prizewinning science fair project. He tested the effects of classical, country and rock music on the cows. Daniel says he and his dad like to listen to music while they milk the cows, without giving the cows much say in the selection. Turns out rock is their least favorite. After listening to Lynyrd Skynyrd, Shania Twain and a selection of classical music, the cows proved they prefer classical to country and rock by producing 1,000 pounds more milk. He received a special award from the American Society of Mammalogists, an organization that supports the study of mammals.